This week’s sweltering summer heat made me crave the chilled Asian noodle salads from my pre-Paleo days (my “salad days,” pun intended), so I decided to make a Whole30-friendly Paleo Hiyashi Chūka (a.k.a. Cold “Ramen” Salad). What’s hiyashi chūka, you ask? 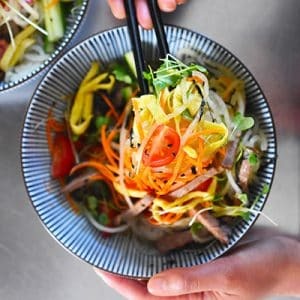 In short, it’s a refreshing summertime ramen salad—cold noodles served with a vibrant assortment of colorful toppings and seasoned with a chilled tare sauce, a sweet, umami-packed soy sauce flavored with mirin, vinegar, and dashi. Influenced by Chinese and Western cuisines, this 20th-century Japanese invention literally means “chilled Chinese food.” I have fond memories of slurping up bowls of hiyashi chūka while Henry and I ate our way through Kyoto; when we returned to San Francisco, we were determined to seek it out in Japantown. Or, rather, I was determined to seek it out. Henry just tagged along to humor me. 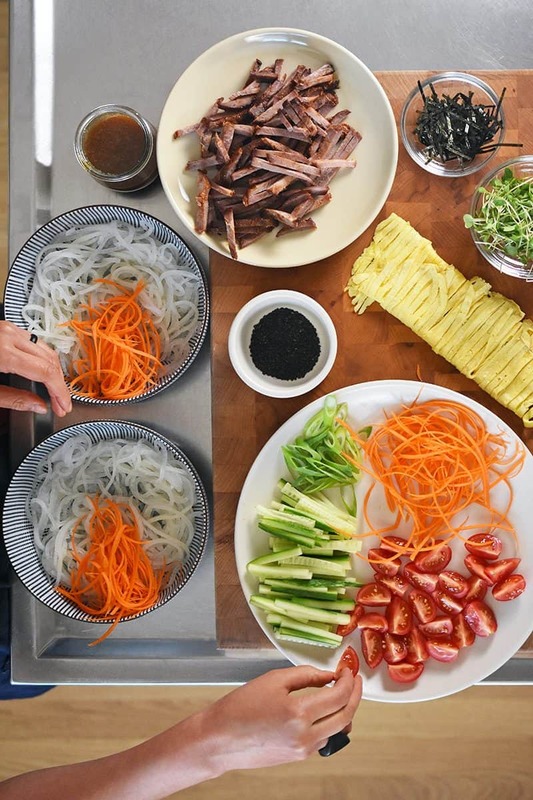 Sadly, like many Asian dishes, hiyashi chūka doesn’t easily lend itself to being Paleo-ized. News flash: Ramen isn’t exactly a staple of caveman cuisine. I resigned myself to a ramen-free existence…until I saw on Instagram that my pal Kyle Hildebrant was frequenting a ramen joint in Portland that served a grain-free version using spiralized vegetables. Naturally, I had to go check it out myself. And as usual, Henry tagged along to humor me. The spiralized veggie noodles at Kayo’s Ramen Bar were fantastic in steaming broth, but in this hot hot heat, I knew what I really wanted was a bowl of hiyashi chūka. Plus, I had a sneaking suspicion that one of my new sauces from Ready or Not!, our upcoming cookbook, could double as the dipping sauce. This veggie-packed, Whole30-friendly version of hiyashi chūka uses spiralized and blanched daikon noodles in place of cold ramen, and my All-Purpose Stir-Fry Sauce turns out to be a worthy replacement for the traditional soy-based tare. But just like the original, this chilled “ramen” salad is topped with a rainbow-hued assortment of julienned meat and veggies that you can customize according to your preferences. If “All-Purpose Stir-Fry Sauce” doesn’t ring a bell, it will soon. This is my go-to sauce for stir-fries, marinades, stews, and much, much more. The recipe for the sauce is in the “Get Set!” section of our new Ready or Not! cookbook, but I’m spilling the beans here today because EVERYONE needs some in their kitchen arsenal. (Note: The recipe for the sauce in this recipe makes just ¼ of what I’d normally whip up, so if you’d like to use All-Purpose Stir-Fry Sauce for other purposes, do the math—or buy our cookbook!—to make a pint of the stuff.) Of course, if you’ve preordered our cookbook and downloaded the bonus thank you gifts, you already got the recipe as part of the 50-page preview of the new book! The whole point of Ready or Not! 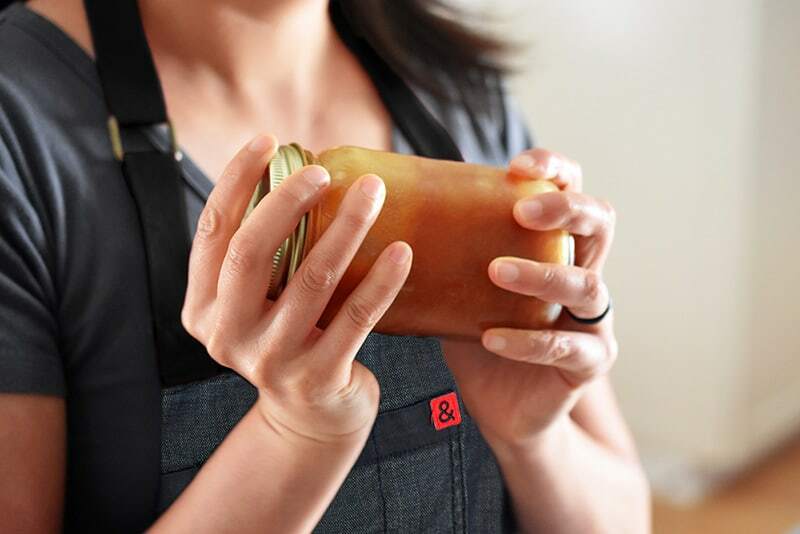 is to arm you with easy to prepare recipes that you can whip up no matter if you’re ready to cook or not—and All-Purpose Stir-Fry Sauce is one of the insanely versatile staples that’ll make cooking a breeze. 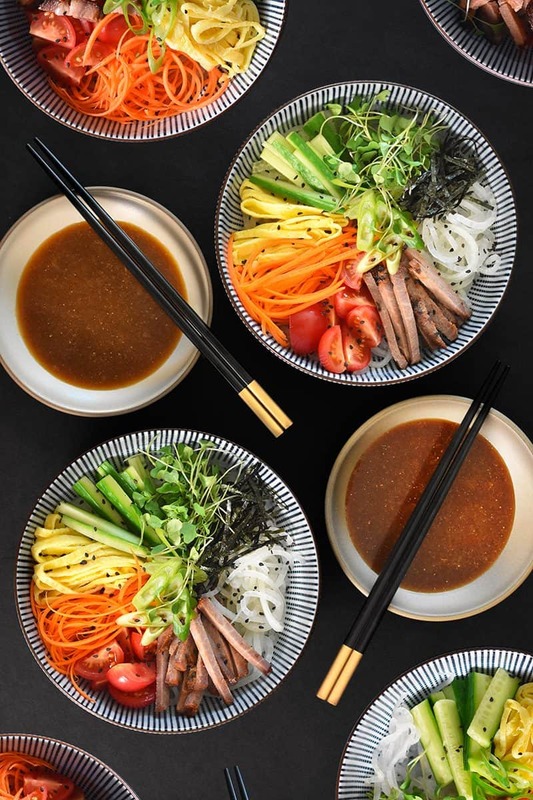 If our cookbook hadn’t already gone to print months ago, this recipe for hiyashi chūka would’ve been featured smack dab in the “Kinda Ready!” section as a prime example of how to combine pre-made ingredients to easily transform and elevate your leftovers in minutes. If you have a bottle of All-Purpose Stir-Fry Sauce on hand and some extra Paleo Char Siu (remember how I told you last week that I’d show you how to repurpose your leftover char siu? ), this recipe will take no time at all. 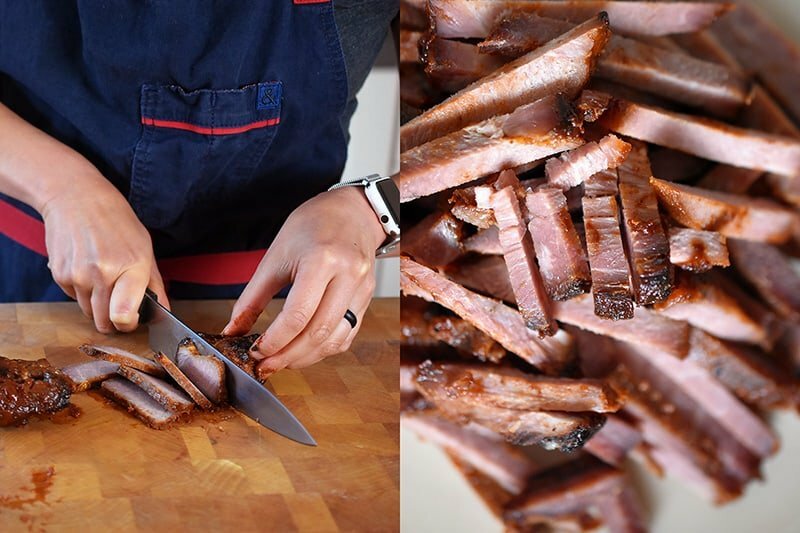 Don’t have any char siu sitting in the fridge? No worries—just top your ramen salad with whatever veggies and meat you have lying around. I bet Wonton Meatballs or Cracklin’ Chicken would be fantastic in hiyashi chūka. Think of this as a choose-your-own-adventure meal! 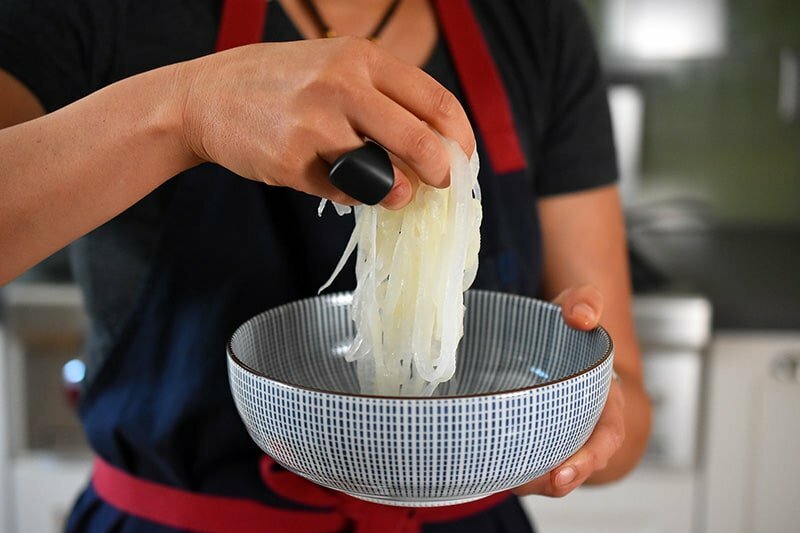 A note about daikon: Yes, you need to blanch and chill the spiralized daikon to get the proper noodle texture and remove the radish-y flavor. Trust me: It’s worth the extra step. Too much work and/or can’t find daikon at the grocery store? Substitute raw celery root, parsnip, zucchini, or jicama instead! No excuses, bub. 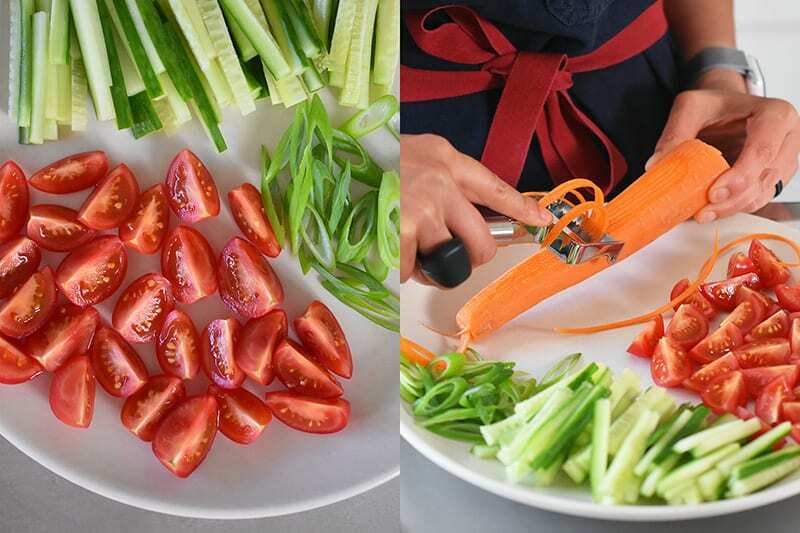 Time to break out your spiralizer! First, shake up a mini jar of All-Purpose Stir-Fry Sauce if you don’t have some already made in the fridge! 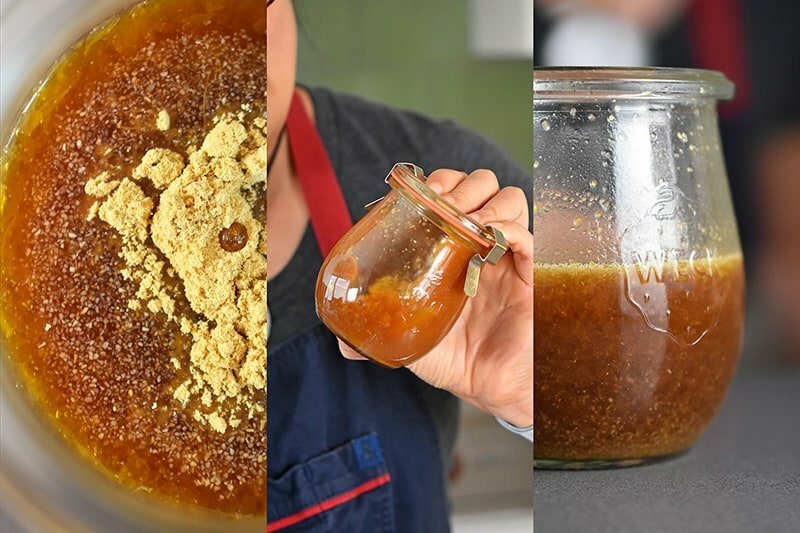 In a small jar, combine the coconut aminos, orange juice, fish sauce, rice vinegar, garlic powder, ground ginger, and sesame oil. Seal the lid and shake vigorously. Label the jar and store in the fridge for up to two weeks in advance. When you’re ready to make the hiyashi chūka, fill a large pot with water and bring it to a boil over high heat. While you’re waiting for the water to boil, assemble the rest of the ingredients. 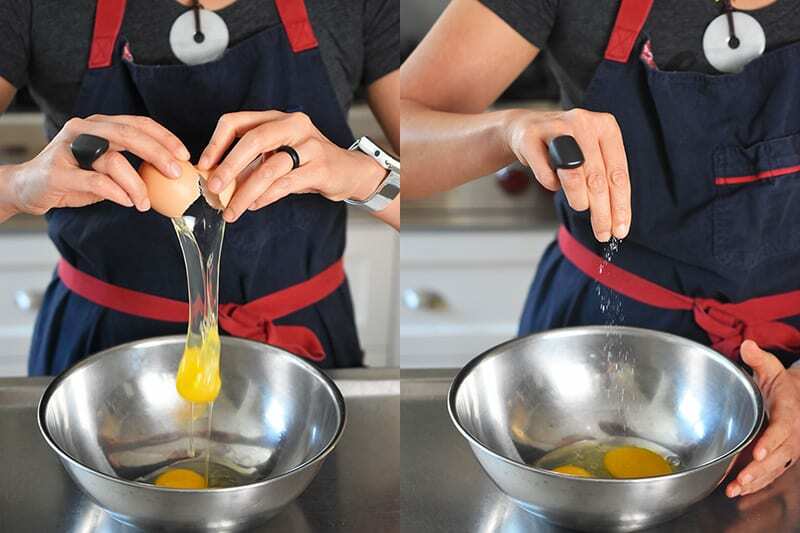 Crack the eggs into a bowl and add about a ¼ teaspoon of kosher salt. Heat a large cast iron skillet, griddle, or nonstick pan over medium heat. When the pan is hot, add the ghee. 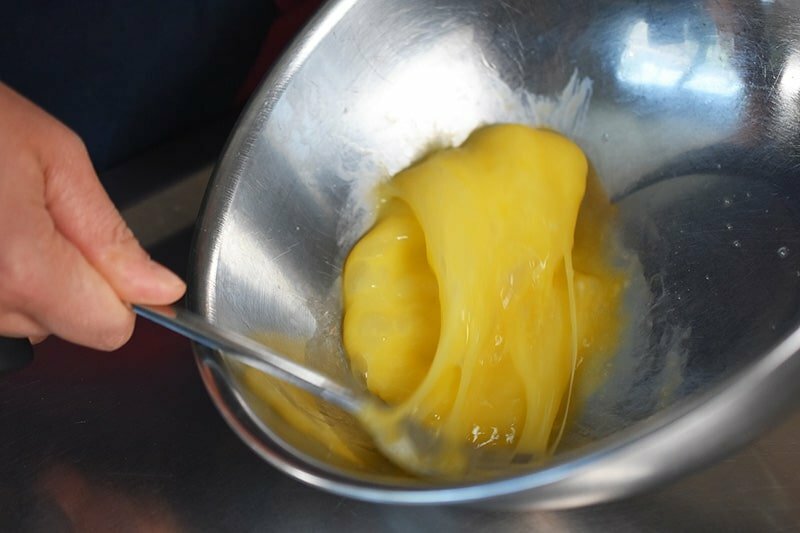 Once it’s melted, pour in the whisked eggs, gently tilting the pan so that the egg covers the surface and forms a thin omelet. 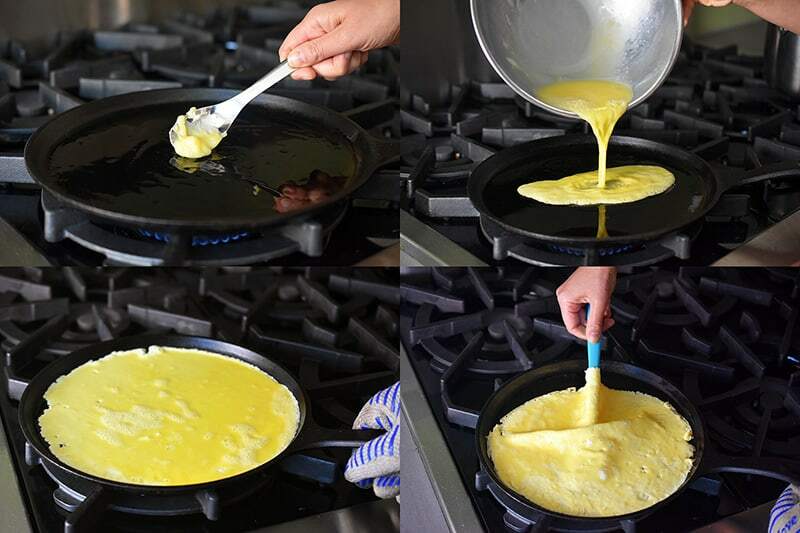 As soon as the omelet has set, flip it over and cook on the other side for about 30 seconds or until cooked through. 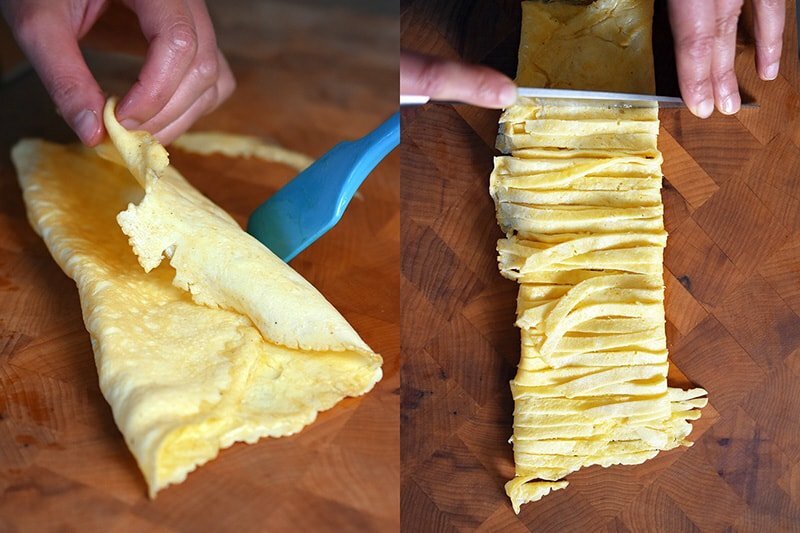 Transfer the omelet to a cutting board and fold it into thirds before thinly slicing cross-wise. Set aside. In the meantime, grab your daikon. Cut the ends off, and peel off the skin. I like to use fat, straight daikon for spiralizing. 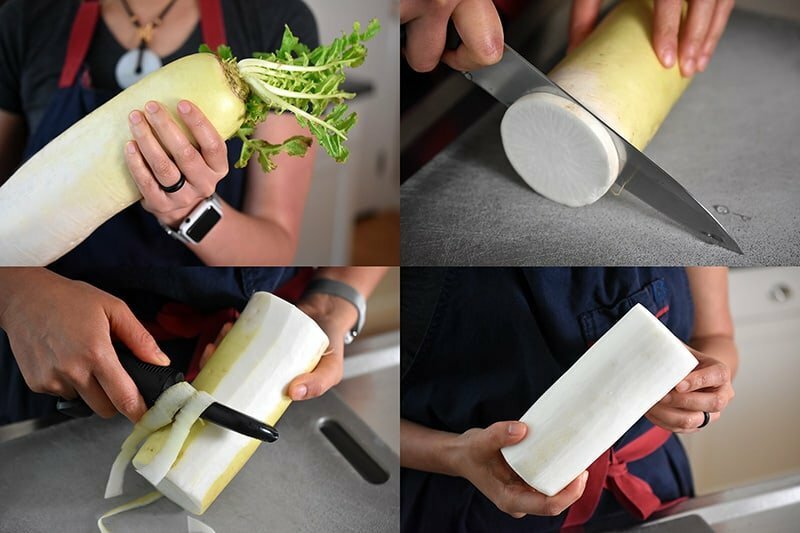 Depending on the size of your daikon (and the number of folks you’re serving), you may need only half of a large one. Spiralize the daikon, and set the daikon “ramen” aside. When the water in the pot is boiling, add a large pinch of salt. 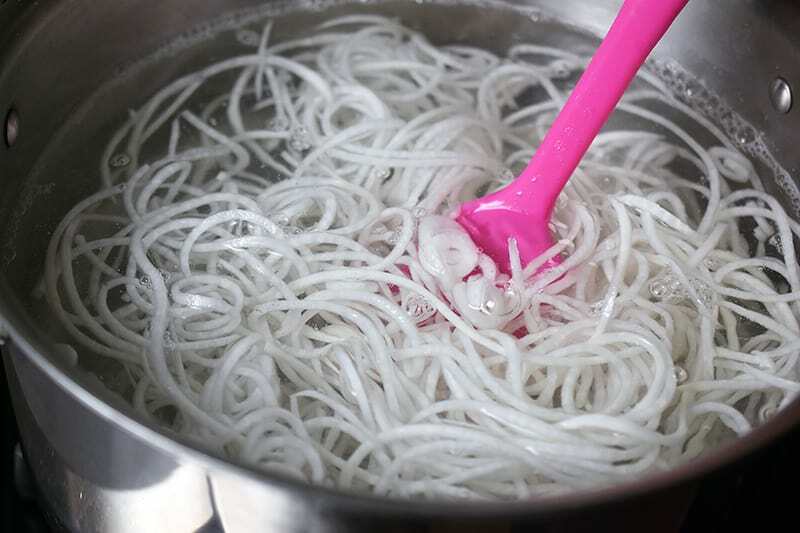 Transfer the daikon noodles to the boiling water and give them a good stir. 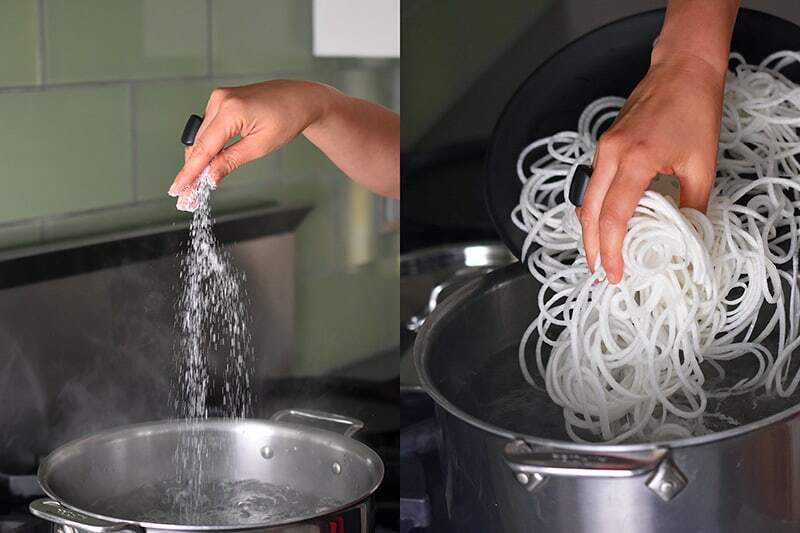 Cook the noodles for 1-2 minutes or until soft, but still al dente. Immediately drain the daikon noodles and transfer them to the ice water bath. Once the noodles are chilled, fish ’em out and dump them back in the colander to drain completely. Divide the daikon into two large bowls. Top with Paleo Char Siu, tomatoes, cucumber, carrots, broccoli sprouts, scallions, sesame seeds, and nori. Or with whatever you have in the fridge! Make it pretty, okay? We eat with our eyes, too! Pour on the All-Purpose Stir-Fry Sauce right before serving and adjust the amount to your taste. Mix everything up, and slurp it all down! Wanna watch me make this dish on my Facebook Live broadcast (recorded on July 26, 2017)? 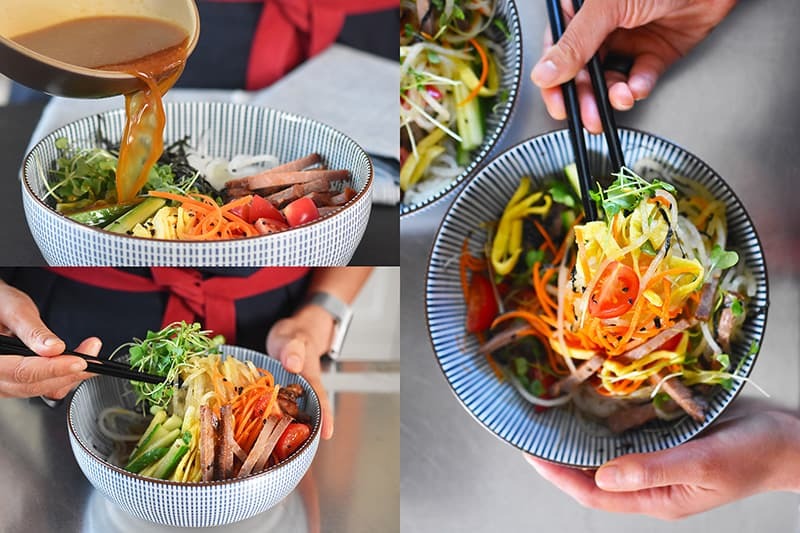 This veggie-packed, Whole30-friendly version of hiyashi chūka uses spiralized and blanched daikon noodles in place of cold ramen, and my All-Purpose Stir-Fry Sauce replaces the traditional soy-based tare. 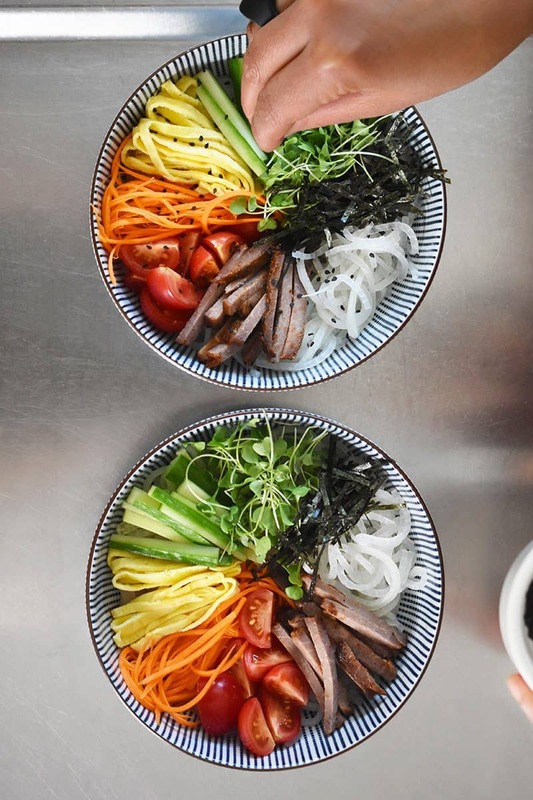 But just like the original, this chilled “ramen” salad is topped with a rainbow-hued assortment of julienned meat and veggies that you can customize according to your preferences. 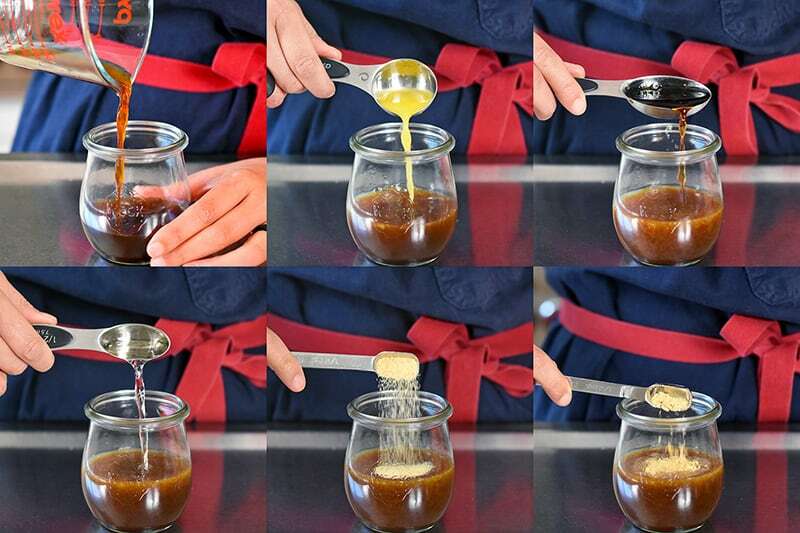 First, shake up a mini jar of All-Purpose Stir-Fry Sauce! In a small jar, combine the coconut aminos, orange juice, fish sauce, rice vinegar, garlic powder, ground ginger, and sesame oil. Seal the lid and shake vigorously. Label the jar and store in the fridge for up to two weeks in advance. When you’re ready to make the hiyashi chūka, fill a large pot with water and bring it to a boil over high heat. While you’re waiting for the water to boil, assemble the rest of the ingredients. Crack the eggs into a bowl and add about a ¼ teaspoon of kosher salt. Beat the eggs well. In the meantime, grab your daikon. Cut the ends off, and peel off the skin. I like to use fat, straight daikon for spiralizing. Depending on the size of your daikon (and the number of folks you’re serving), you may need only half of a large one. 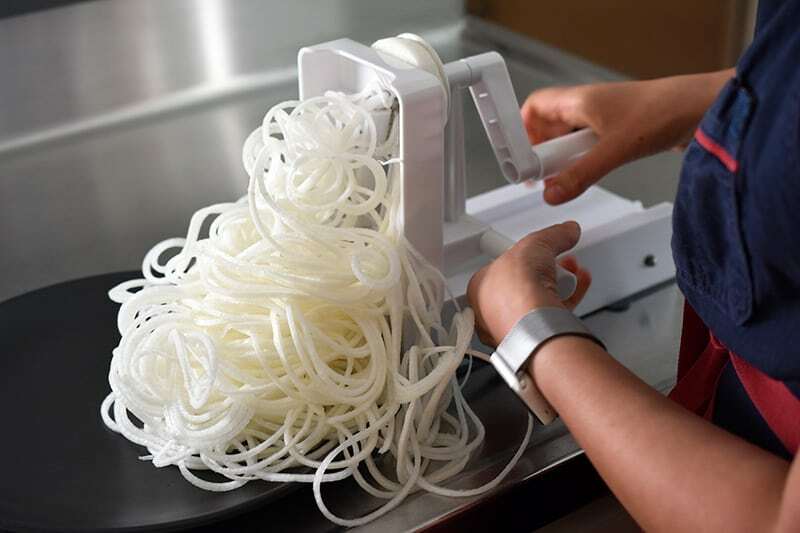 Spiralize the daikon, and set the daikon “ramen” aside. 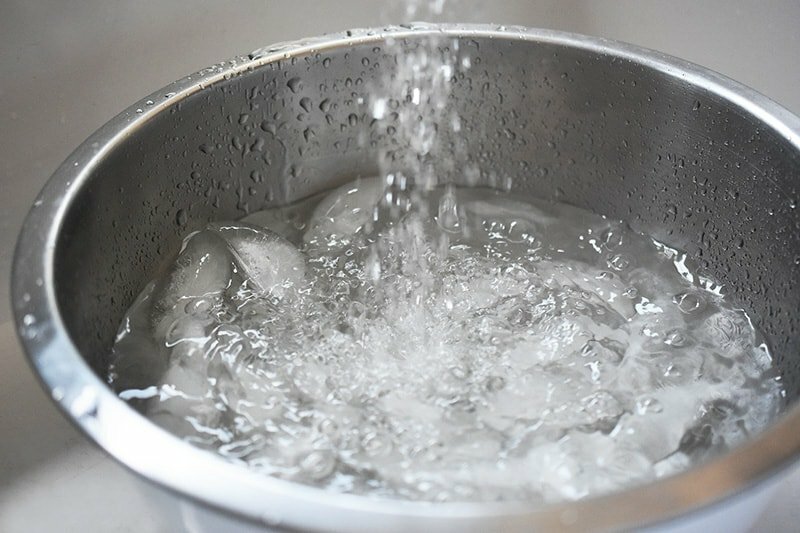 When the water in the pot is boiling, add a large pinch of salt. 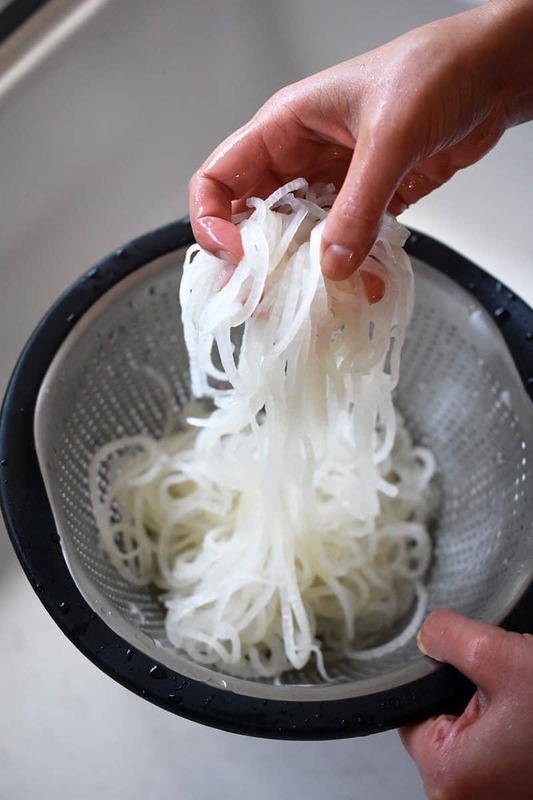 Transfer the daikon noodles to the boiling water and give them a good stir. Cook the noodles for 1-2 minutes or until soft, but still al dente. 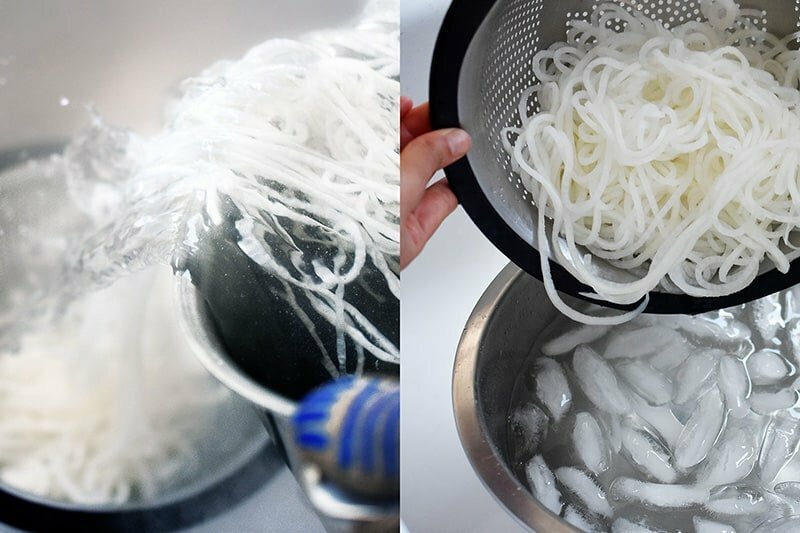 Immediately drain the daikon noodles and transfer them to the ice water bath. Once the noodles are chilled, fish ’em out and dump them back in the colander to drain completely. Divide the daikon into two large bowls. Top with Paleo Char Siu, tomatoes, cucumber, carrots, broccoli sprouts, scallions, sesame seeds, and nori. Or with whatever you have in the fridge! Yes, you need to blanch and chill the spiralized daikon to get the proper noodle texture and remove the radish-y flavor. Trust me: It’s worth the extra step. Too much work and/or can’t find daikon at the grocery store? Substitute raw celery root, parsnip, zucchini, or jicama instead! No excuses, bub.